Founded in 2001 and directed by Solange Gomes, Tablado Dance Company is dedicated to sharing its passion for the dance, music and culture of Spain and is known for maintaining the ethnic richness of FLAMENCO. The company (guitarists, singer, percussion and dancers) combines the vigor and passion of a traditional Flamenco with the vitality of the modern style through unique musical arrangements made by this authentic ‘cuadro flamenco’. Tablado’s concerts blend aesthetics meld genres and connect to your heart. For the past decade Nancy Takacs has worked with inmates, seniors, and children for the Utah Arts Council’s Artist in Education program. 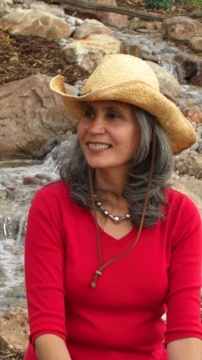 Former wilderness studies instructor and creative writing professor, she is an emeritus professor at Utah State University Eastern. 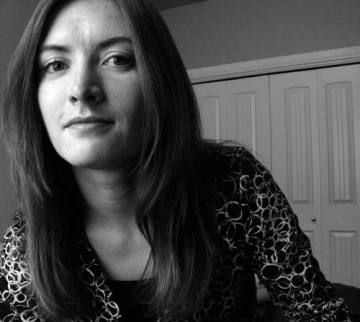 She is a recipient of the Nation/Discovery Award, Kay Saunders New Poet Prize, is a six-time first-prize winner of the Utah Arts Council’s Original Writing Contest; and has twice been a finalist for the Utah Book Award. She has three chapbooks: Pale Blue Wings, Juniper, and Wild Animals; and a book Preserves. A new book Stem is forthcoming in 2014 from Blue Begonia Press. Takacs’s poems have appeared in Rattle, Weber Journal, The Tampa Review, Nimrod, Clover, Red Rock Review, Sugar House Review, Main Street Rag, and Verse Wisconsin. She lives in Wellington, Utah, spending summers in a cabin in Wisconsin. Takacs is originally from Bayonne, New Jersey. Siren State presents a delicious blend of harmonious vocals, unique songwriting, and wickedly talented musicians. Based in small town USA, this group brings good old-fashioned country up-to-date with rockin’ licks and top-notch harmonies. Siren State serves up a solid mix of music, ranging from Fleetwood Mac to the Judds, and everything in between, making sure to put their own twist of flavor into each rendition. Siren State’s members have opened for several artists such as John Michael Montgomery, Chance McKinney, Jagertown, Due West, Bar J Wranglers and many more. Siren State is set to take the West by storm this summer, so hold on to your hats, ’cause you’re guaranteed to fall under their spell! Composer, vocalist and producer M Ryan Taylor is the author of three operas, dozens of choral works, art songs, song cycles and other works. His newest opera, based on George Macdonald’s fairy tale, The Giant’s Heart, will recieve its premiere in the Spring of 2011. Taylor self-produced, directed and performed in his chamber opera, The Other Wise Man, based on the story by Henry Van Dyke, in 2006-7. His first opera, Abinadi, was premiered, filmed and broadcast by Brigham Young University in 2003. Notable song cycle premieres include the Moon Songs (winner of the Vera Hinckley Mayhew Composition Contest) by soprano Heather Chipman and pianist Dwight Bigler, A Light that Shames the Noonday Sun at the BYU 200th birthday celebration of Joseph Smith Jr. by tenor Lawrence Vincent and pianist Scott Holden, and All Heaven and it was One Hour Old (based on the Christmas poetry of Catherine Tynan) by soprano Venicia Wilson and pianist Lynn Jemison-Keisker. Taylor has performed leading roles in Cosi Fan Tutti, Tartuffe, The Merry Wives of Windsor, as well as his own operas Abinadi and The Other Wise Man. He has also performed a number of musical theater roles, recently including Rev. Shaw Moore in Footloose. He was a featured singer at the BYU Aaron Copland 100th Birthday Celebration, has performed-championed the work of other living composers at The Utah Mid-winter Song Festival and concerts of The Salty Cricket Composers Collective. Taylor is the co-founder of the Salty Cricket Composers Collective in Salt Lake City which three times a year performs concerts of works by composers residing in Utah, as well as the founder of the Utah Mid-winter Song Festival, produced in conjunction with the American Fork Arts Council. 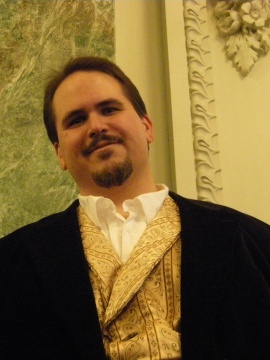 Taylor has extensive experience as a choral conductor and currently directs The American Fork Children’s Choir. Taylor’s discography includes the Christmas-themed EP All Heaven and it was One Hour Old, featuring soprano Venicia Wilson and pianist Lynn Jemison-Keisker as well as two solo albums, American Revolutions and children’s album Thirteen for Halloween. These albums and many of Taylor’s scores are available at MRyanTaylor.com. The six members of Eclipse originally met while performing in a public relations /ambassador-oriented group that was part of the department of Programs and Entertainment at Utah State University. They began by arranging their own vocal covers of popular songs and performing them on campus and in the Logan area. Increasing public interest and performance opportunities led to the recording of their first album, "Once," which was released in April 2001. Following the release, the band’s main focus shifted to gaining exposure. They auditioned for, and were accepted to compete in, the Northwest Regional Harmony Sweepstakes Competition. They took first place and were featured at the National Competition in May 2001 with the 8 other Regional winners from around the nation. In Utah, concerts and contacts continued and relationships were developed as Eclipse began performing with local artists such as Colors, John Schmidt, Peter Breinholt, and Kurt Bestor. In September 2001, Eclipse was asked by Kenny Ortega, Olympic Ceremonies Director, to perform a featured number in the Opening Ceremonies for the 2002 Olympic Winter Games. This led to other opportunities, including a featured spot in the Closing Ceremonies and a series of appearances at the Medals Plaza opening for such acts as Brooks & Dunn, Nelly Furtado, and Train. Shortly after the Olympics, Eclipse was asked to be a featured guest along with Larry King and Toby Keith at the "Stadium of Fire," the 4th of July celebration at BYU’s Cougar Stadium. Eclipse released their second album, "Think Twice," in October 2002. They also became the 2002 winners of the Rocky Mountain Regional Harmony Sweepstakes. In 2003, Eclipse was named "Best Vocal Group" in Utah’s Best of State awards and "Group Recording Artist of the Year" in the Faith Centered Music Association’s Pearl Awards. They released their third album, a Christmas CD called "Three Kings" in October 2003. In 2004, Eclipse received three more Pearl Awards, including “ Holiday Album of the Year,” and were the runners-up for “Best Holiday Album” in the Contemporary A Cappella Recording Awards. They also received two Just Plain Folks Music Awards (the world’s largest music awards program, honoring independent musicians in over 85 countries). 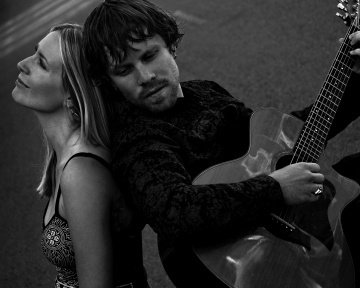 Billy and Grace’s performances are alive with chemistry, charisma, and a wide range of musical styles~ from gypsy jazz and bluesy folk to back porch pickin’ and lyrical freestyle flows. 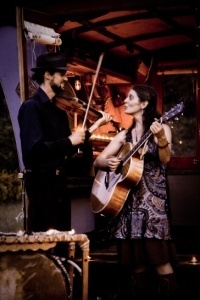 They play guitar, fiddle, and a homemade percussion kit, and will also throw in some story-telling, tap-dancing, poi-spinning, and other gypsy tricks. Billy and Grace bring a deep connection to the natural world to their music and teaching. These two artists wish to inspire their audiences and students to step into their power as creative, imaginative, passionate human beings capable of making dreams reality. Please visit www.billyandgracetea.com to learn more about Grace and Billy’s projects. Award-winning sculptor Karen Jobe Templeton is best known for Heroes Among Us, her work memorializing the miners who died in Utah’s Crandall Canyon Mine Disaster. Also for her steel and glass sculptures based on petroglyphs of the prehistoric peoples of North America and for her portraiture (3-D, bas relief and monumental). No matter what the medium –steel, glass, bronze, copper, and even paper – her public installations have earned her a reputation as an artist whose works are as moving as they are unique. For example, the towering 11-foot tall steel and glass The Storyteller has been an iconic landmark on Grand Junction, Colorado’s Main Street for over a decade – a beloved work of art for locals and a popular photo opportunity for tourists. In contrast, the two paneled 12-foot long all night conversations, has intrigued viewers as they stand at a distance searching for faces in the piece and then are pulled up close to the work to search for the 80 or 90 words that poet Nancy Takacs selected to be stamped into the steel of the sculpture. Awards include: the American Artists Professional League’s Kathryn Thayer Hobson Memorial Award, Leonard J. Meiselman Memorial Award for Traditional Sculpture, AAPL; Catharine Lorillard Wolfe Arts Club’s Anna Hyatt Huntington Bronze Medal for Sculpture, and three separate awards from the Portrait Society of America, including First Place, Portfolio. Josh has been in over 20 local productions on stages at both Hale Theaters, the Grand, the Scera, The Conference Center Theater, and many more. He got back into the film business when he auditioned for the second Liken movie, Ammon & King Lamoni. He has gone on to appear in 6 of the 8 Liken movies. Josh started singing and acting at 8 years old, he was the voice of Freddy on Janeen Brady’s "The Safety Kids." He also did many local and national commercials as a kid. Once Junior and Senior High school rolled around, Josh stuck to singing in the choir and being in a school play or two. At college he continued to sing, and got hooked on Musical Theater. The artist known as "Phread" I have been a performance poet, slam master, actor, writer, singer, comic and storyteller for many years. I have also worked in PR, events production, non-profit consulting & fund raising (including marketing & development), project management, tech writing, and public speaking. In addition, I have worked as a radio and newspaper reporter as well as an editor for all kinds of publications. I have taught ESL classes and done some substitute teaching in various schools. I am a full-time student at the University of Utah for the next year, completing a minor in Creative Writing and a major in Mass Comm/PR. 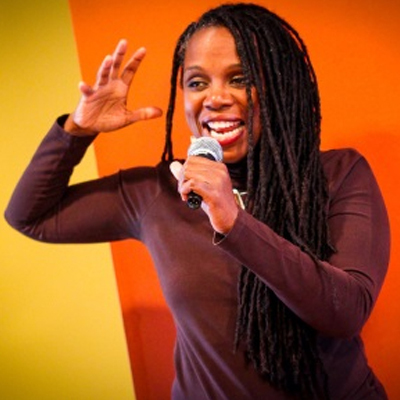 I have performed at First Night, BMOCA, The Irradiated Poets Summer Event and at many other events and schools in Utah, Colorado, Oregon and Washington. I am also a published poet, having some of my poetry appear in several regional and national magazines and quarterly anthologies. I have also had some of my short stories electronically published at Warm Fuzzy Stories and GrandpaGrandmaSmith, among other newsletters. And I’m working on a novel or two, plus several more short stories and screenplays. My web site should be operational soon, too! 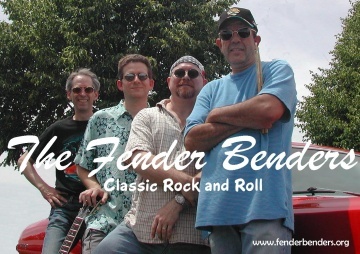 If you want a fun band for your event, The Fender Benders is one of the best classic rock bands in Utah. In the last 10 years, we have played for hundreds of county fairs, arts festivals, city concerts in the park, rodeos, car shows, demolition derbies, corporate parties, weddings, birthday parties, reunions, and many other events, up and down the Wasatch Front and beyond. We have a very broad demographic appeal and always get favorable crowd reactions and comments. People at our performances are often seen smiling and singing along with the songs. Our repertoire includes songs everybody knows: true "classics" from the golden age of rock: the late 60s, the 70s, and the early 80s. Our sound is genuine and true to the genre, with full instrumentation on vintage instruments, rich lead vocals, and tight harmonies. Our extensive play list (over 6 hours of music without repeats!) allows us to tailor our performance for a wide variety of events and venues. Demo videos, resumes, song list, and technical requirements are accessible at our website, www.fenderbenders.org. You may reach us at 435-770-2175, or at info@fenderbenders.org. Over the years Glen has crafted a wide range of saddles including ones specifically designed for paraplegic riders and a number of saddles for national rodeo champions, Shawn Davis and Lewis Fields. He also has made several Queen saddles for Miss Rodeo Utah and Miss Rodeo America pageants. 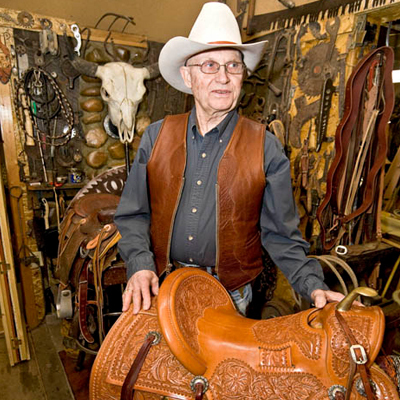 In the early 1980s he crafted a one of a kind saddle featuring beehives,Utah state symbol. For the last twenty years the Beehive Saddle has been on display in art museums,including the Renwick Gallery of the Smithsonian in Washington D.C. Glen has received numerous awards for his work including the prestigious Utah Governors Folk Art Award. Glen is part of a western crafts tradition that has long been valued by the working ranchers and cowboys of the region and is becoming more and more valued by those who appreciate hand crafted art. For a glimpse of this important regional traditional and fine craft, visit Glen in his tool-lined shop. Smell the leather and watch him expertly stamp intricate designs into leather. In this Huntsville workshop in the middle of a beautiful mountain valley, you’ll know you’ve seen a piece of the real West. I graduated from Brigham Young University in 1997 with a degree in Theatre Arts Education. During my education, I participated in the production of both films and plays directed by students, faculty and professionals at the LDS film studio. As a high school teacher, I composed and directed the musical play "A Knight in Shining Rags" performed by Taylorsville High School in 1997. I also directed this play for amateur theatre groups in Arizona and Idaho. Other plays I have been involved in both as actor and technical crew: Peter Pan, Into the Woods, The Crucible, Harvey, To Kill a Mockingbird, and many others. Recently, I have served as a stage makeup artist for amateur theatre groups in Tooele and Grantsville. Lynnette Thredgold, an accomplished local violinist has a wide range of violin pieces that will captivate your audiences . Having performed with many of this country’s most talented performers and bands has provided her an extensive professional background offering a presentation that satisfies every palate. Classically trained styling, along with unique creative prowess brings a plethora of musical pieces, including jazz, pop, rock n’ roll, latin and blues that will leave listeners in awe. Audiences wil become mesmerized by the music. Lynette has produced three CDs, "Amazing Grace", "Dancing With the Red Priest", and "Cool Energy". Please feel free to visit her website at www.lynnette.com. Lorin Thunell is a designer, silversmith, and owner of “Four Corners Silverworks.” He has spent 30 years behind the bench and desk as a jewelry artist and instructor at the high school, university, and currently the college level. "I try to instill the same passion for creating jewelry to my students that I feel every time I sit at my bench and fashion a silver object. Making jewelry is more than putting parts together, it is the art of visualizing an idea, designing it on paper so as to work out the relationship between the design, choice of metal and stones, and the technical expertise to make it all come together". Lorin lives and teaches in Utah, one of only four states in the United States where four corners meet or touch each other—Utah, Colorado, Arizona, New Mexico. "I love the folklore of the west. I am especially drawn to the petroglyphs chiseled and painted on the canyon walls of the four corners region. The stories etched in stone inspire the “figures” I design and create, I take pride in my jewelry creations and I am most happy when I see them get a good home. Perhaps you are looking for unique, one-of-a-kind jewelry, then his work may fill your needs and tastes. Vaopele is passionate towards anything that he does. He is experienced, highly versatile and proficient in the following mediums; graphic design, graffiti art, sign painting & handlettering, apparel imprinting, digital printing to the advanced technology of web design. As an artist, he’s been able to assist in preserving his culture portrayed in his high-contrast black & white style of Polynesian Fine Art. Mister Tim is a singer, performer, and composer specializing in all-vocal music. Known locally for his comedy a cappella group MOOSEBUTTER, with whom he has sung and toured nationally for 10 years, Mister Tim has also created dozens of successful performing groups, including junk-based percussion ensemble THE BUCKET BRIGADE, 2010 Harmony Sweepstakes National Champions PLUMBERS OF ROME, all-vocal rock bands THROAT and VOXBOM, as well as his solo vocal performances. He was a headline performer on the Las Vegas strip with Toxic Audio, and travels extensively to perform and teach at vocal, choral, and a cappella events and festivals. As the ONE-MAN VOCAL BAND, Mister Tim ‘live-loops’ his voice to create full songs, including drums, instruments, and harmonies. Drawing on his years of professional vocal work and experimentation, he performs several music programs around the United States, including his ONE-MAN VOCAL BAND music variety show and the theatrical concert program VOCAL MAGIC. His original music is a meld of modern beatboxing/funky cool and cerebral storytelling-based songwriting. He also performs a selection of uniquely-crafted arrangements of popular covers. Mister Tim’s performing groups are regulars at the Utah Arts Festival and at Rocky Mountain theaters, events, and schools. Rebekah Timlin Meddles grew up on a small farm in Michigan where she was successfully "unschooled" by her artist parents. She learned metalsmithing and clay work from her father, Hugh Timlin and went on to study art and dance at the University of New Mexico where she studied under Gina Bobrowski (ceramic sculpture), Constance DeJong (small metals/casting), Suzanne Stern (jewelry/small metal fabrication), and many others. She enjoys mixing media – especially clay and metal in her sculptures and focuses on organic elements in her every day wear kind of jewelry. Rebekah is now a Utah resident with her Chef husband, Scott and their 3 young boys. Seethe Sop, sluice squally steel Sky slopes slantingly sleek Sagacious seek sop Observation, insectual compound eye, allows for rich multifaceted description and definition of structure with the hope of expanding ephemeral understanding. Formally trained and educated at the University of Utah, my philosophy of ceramic design and investigation purposes profound expression of nature and the human condition through a metaphysical lens. That having been said, I truly enjoy working with clay in the traditional sense of being a potter–designer of vessels. As a young man, Stan Tixier was a working cowboy on a ranch in southern Colorado. He spent 4 years in the Navy during the Korean War and then attended the University of Arizona on the GI Bill. He had a career with the US Forest Service, retiring in 1991 as Regional Forester of the Intermountain Region in Ogden. 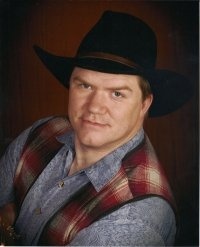 He has been writing cowboy poetry for nearly 2 decades and has recited throughout the west. His poem, "Spurs" is featured as the cover poem on the 2008 Western Horseman Magazine Calendar. He is also a published author with 3 novels to his credit. Stan and his wife of 50 years, Jan,live in Eden, UT, where they raise Foxtrotting horses. 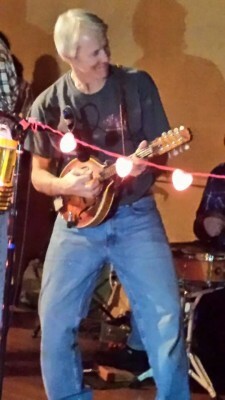 Michael Tobian is the band leader of several well known groups in Utah including the Utah Swing Orchestra, Roadside Ramblers and the Michael Tobian Jazz Quartet. 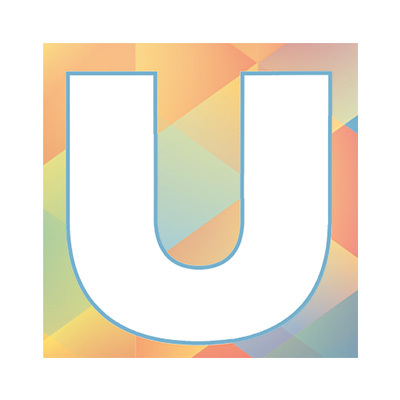 He also owns Utah Live Bands, a booking agency representing many different event bands in the area. Ever since his high school days, Michael Tobian has been playing and teaching music professionally. Mike graduated in jazz studies as a music major at Brigham Young University. There, he played lead tenor saxophone with Synthesis, BYU’s premier big band. With Synthesis, he toured Europe and performed at some of the worlds largest jazz festivals including the San Sabastian Jazz Festival. While a student, he received many national awards and honors including hansom scholarships awarded by National Jazz Festivals from solo competitions. As a local professional, Michael is one of the first call musicians for live performances, recording sessions and commissioned jazz writing and arranging. He has performed along side many of the biggest names in the music industry**. He owns the company Utah Live Bands, one of the premier and most trusted live music booking agencies in the western United States. In this capacity, he performs with and books some of the best and most popular event bands in Utah and the surrounding states for corporate events, upscale weddings, recording sessions and concerts. In addition to live music, his saxophone playing can be found recorded on TV commercials, music albums, commercial productions and other projects. 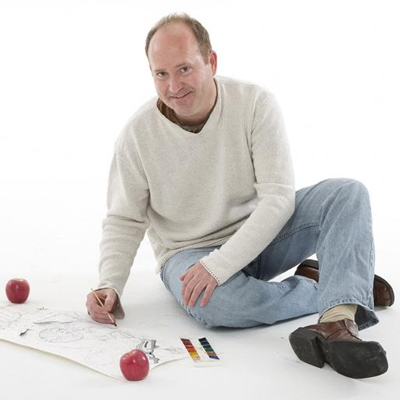 Michael is a well known and in demand teacher and clinician around Utah and Salt Lake counties. Mr. Tobian is a faculty member at Brigham Young University and Utah Valley University. At BYU, he directs the BYU Jazz Jab Band and Jazz Combos. At UVU, he teaches all of the jazz classes including "jazz improvisation", "the UVU Jazz Ensemble" and jazz combos. He authored the textbook "Fundamentals of Jazz Improvisation" used in the jazz improvisation class at UVU. He has also taught and directed several award winning high school and Jr. high bands at "the Music School" in American Fork and is a member of the International Association of Jazz Educators. Michael’s students have won superior awards at solo festivals and have gone on to become music majors in college. Janet Todd is one of America’s premier accordionists, an international jazz champion and World "Old Time" duet champion. She has traveled over 250,000 miles throughout the U.S., Europe, Middle East, and Far East playing in 23 countries and 27 states. She plays a wide spectrum of music and stylizes it for audience high impact—from classics, semi-classics, polka, ethnic, Broadway, movie themes, American and international folk, bluegrass, patriotic, popular, to soft-jazz. As a recording studio artist, her music has been used in films, videos, TV, CDs, and commercials. She knows how to entertain and has performed with stars on the West Coast and as they have traveled through her home-based Rockies. Janet is a solo entertainer who also plays in everything from polka bands to the Utah Symphony, from jazz combos to a wide variety of "casual groups." Reviews and articles say of Janet—"World Class," "a virtuoso," "dynamic," "distinguished," "rocked the house," "masterful in entertaining," "the Jimi Hendrix of the accordion," "great showmanship with personal and dynamic arrangements," "a fiery style," and on Utah Public Radio: "If you want to hear how the instrument is really fabulously played, go hear Janet Todd somewhere." Fuddy duddy, dilly dally, lickety split, Wack-a-doo, kookaburra, didgeridoo Weinersnitzel, snicker doodle, gobbledygook, I love fun words, how about you? For me there are few things better in life then sharing my love of reading and writing with kids. I have 28 years of teaching experience, working as a speech-language pathologist and English as a Second Language teacher, and I now have three picture books published. My books are published in collaboration with the Lazy One pajama company and have pajamas to match. Kory has returned to the stage as Potiphar in "Joseph and the Tamazing Technicolor Dreamcoat" For the Herriman Arts Council’s Summer 2011 Production Kory Trapane has most recently produced "The Music Man" for the Herriman Arts Council in July 2009. He also directed "Night at the Library," Herriman Arts Council’s surprise hit Summer 2007 at the Rosecrest Pavilion. In 2008, Kory directed "The Sound of Music" for Herriman’s Summer Production. In his younger years, Kory has been both on the stage and behind the scenes on several productions such as "West Side Story," "Our Town," "Mash," "Airline" and several community productions. He went on to study Public Relations and Art at USC. More recently he has produced and directed short films for the community. By day, Kory is an accomplished graphic designer/photographer and heads his own company, Aydia Studio, right here in Herriman, UT. Stephen Trimble has received significant awards for his photography, his non-fiction, and his fiction, and the breadth of those awards mirrors the wide embrace of his work: The Sierra Club’s Ansel Adams Award for photography and conservation; The National Cowboy Museum’s Western Heritage Wrangler Award; and a Doctor of Humane Letters from his alma mater, Colorado College, honoring his efforts to increase our understanding of Western landscapes and peoples and his choice to remain a stubborn generalist. Environmental historian James Aton has said: Trimble’s books comprise one of the most well-rounded, sustained, and profound visions of people and landscape that we have ever seen in the American West. As writer, editor, and photographer Trimble has published twenty-two books. Nikki Trionfo lives in Riverton, Utah with five kids, a CrossFit-training husband who writes computer code, and lots of hip hop background music. Her teen murder mystery, SHATTER (May ’17 from Cedar Fort), won grand prize in LDStorymakers’ First Chapter Alongside Heather Clark, she hosts free writing webinars on YouTube at #50FirstChapters. A committed party-girl, Nikki serves as the social coordinator of LDStorymakers Conference and chair of Storymakers Tribe. Other notable stuff includes an honorable mention in Writers of the Future and a spot in Utah Horror Writer’s shorty-story anthology. This all sounds really serious, but if you run into her, she gets down. Truly. TURN City Center for the Arts is an arts day program for individuals with disabilities. We provide classes in poetry, short stories, ceramics, painting, collage, movement, dance technique, improv, drama, drumming, singing and more! We are turning dreams into reality, every day! I convert photographs with a computer into scroll saw patterns and cut your portrait out of high quality baltic birch, back with contrasting color cloth, and frame for a unique one of a kind portrait. I also make wood egg roller toys for 1-3 year old children using patterns I developed (The patterns are also for sale. Wood turned items include:christmas ornaments, bottle stoppers, baby rattles, and small boxes, and pet burial urns. A person with a style. Story telling is a natural for Deidre. Ronan Tynan is truly a modern day “Renaissance Man.” Faced with numerous challenges throughout his well documented life, he has persevered with enormous passion and determination. He attributes his success to his faith and the knowledge that the Man Above guides him through every door he opens. Introduced to international audiences as a member of the Irish Tenors, Tynan quickly became known for his unique voice and irresistible appeal. Following his mother’s advice to always follow your dreams, Tynan decided to launch a solo career, and has achieved the fame and adoration that could have existed only in the farthest reaches of his dreams. Tynan’s singing offered the gentlest consolation at the funeral of President Ronald Reagan in the summer of 2004, when an international TV audience of more than 35 million heard him sing “Amazing Grace” and Schubert’s “Ave Maria,” at the personal invitation of Nancy Reagan. Ronan is also famous for his performances of “God Bless America” at Yankee Stadium during the seventh-inning stretch, which he says have been nothing short of unforgettable. In 2006 he started an affiliation with the Buffalo Sabres hockey team and has performed "God Bless America" at many of their games. Ronan’s ability to simultaneously console and inspire is well-documented. In the wake of 9/11, the men and women of the New York Police Department and New York Fire Department and their families have been able to count on Ronan Tynan’s abiding concern and beautiful voice. Ronan has performed at benefits and memorial services for New York’s Finest and Bravest, and his singing softened the sorrow of many in the wake of the tragedy. Of course, there have been plenty of joyous moments in Ronan’s career as well. In the spring of 2004, the Belmont Stakes got off to a rollicking start when Tynan—a passionate horseman himself—christened the race with a ringing rendition of “New York, New York.” This is of particular interest marking the first time ever in Belmont’s 30-year history that a singer was invited to perform live as they traditionally play the version recorded by Frank Sinatra. Tynan has performed for countless dignitaries worldwide including the wedding of New York’s former Mayor Rudolph Giuliani to Judith Nathan on the grounds of Gracie Mansion. His voice also brightened the 80th birthday celebration of former President George H.W. Bush in the summer of 2004 in Houston. In the spring of 2005, Ronan released his self-titled debut album, which began a new era in his career. “I think it shows a greater versatility than any other album I’ve done,” Tynan has said. “I wanted to sing a greater variety of music and spread my wings a bit, make a move out of the classic ‘Irish tenor’ vein.” The album contains the heartfelt “Passing Through,” which honors Ronan’s mother, whose vibrant spirit has been taken away by the long night of Alzheimer’s disease. Ronan debuted #2 on Billboard’s Classical Crossover Chart, just behind Josh Groban, and was the 8th best-selling classical crossover album of 2005. It also reached #2 on the World Album Chart and peaked at #9 on the Contemporary Christian Chart. His career has also been well-documented with appearances on Primetime Live, Good Morning America, the Hour of Power, 700 Club, Fox & Friends and many other high-profile television shows. Ronan sang at the White House Governors’ Ball at the invitation of President and Mrs. Bush in February, 2007, and in 2008 returned to the White House to sing at the St. Patrick’s Day Reception attended by members of the U.S. and Irish governments. He performed during the Concert of Hope prior to the Papal Mass at Yankee Stadium in April, 2008. He is currently in the recording stages of two upcoming CD releases, one an all-Irish CD, and a second collection of songs performed at his concerts and requested by fans throughout the world. In 2007 due to popular demand, he released a DVD of his motivational speech: Hitting the High Notes, Living Life to the Fullest. Though Ronan enjoyed singing as a boy, he did not seriously consider formal voice study until he was 33, when he was well into his residency as a physician. His quick success is a typical development in a life of extraordinary achievement. Born with lower limb disability that threatened to sideline him throughout his childhood, Tynan was still “as wild as a March hare” when he was a growing boy, riding horses and racing motorcycles. When he was twenty, his legs had to be amputated below the knee after an auto accident caused serious complications. Just weeks after the operation, he was climbing up the steps of his college dorm, and within a year, he was winning gold medals in the Paralympics as a multitalented athlete. Between 1981 and 1984, Tynan amassed eighteen gold medals and fourteen world records of which he still holds nine. The determination instilled in Ronan by his parents, a diminutive couple with gigantic ambitions for their son, soon propelled him to conquer a whole new field. Tynan became the first disabled person ever admitted to the National College of Physical Education. He later became a full-fledged medical doctor, specializing in orthopedic sports injuries, with a degree from prestigious Trinity College. Ronan won both the John McCormack Cup for Tenor Voice and the BBC talent show Go For It less than one year after beginning the study of voice. The following year, he won the International Operatic Singing Competition in Maumarde, France. He made his operatic debut as Pinkerton in Puccini’s Madame Butterfly, and cut his teeth on the concert repertoire in performances of Verdi’s Requiem, Mendelssohn’s Elijah, Handel’s Messiah, Rossini’s Stabat Mater, and Puccini’s Messa di Gloria. In 1998, Tynan joined Anthony Kearns and John McDermott (later Finbar Wright) as The Irish Tenors, an instant worldwide sensation. His autobiography Halfway Home was published in February of 2002. Ronan is one of the most sought after motivational speakers in the U.S., presenting nearly 50 speeches annually for major international corporations and organizations. The big Irishman has a special relationship with American audiences now, and he considers New York his home away from home. “New York is powerful and intense, and it begs you to take it on,” Tynan marvels. “If you do that and do it right, it will give you absolutely everything you want. The thing I love about New York and the states is that there are so many people who want you to do well. They will you to do well. They encourage you, and they rejoice in your success. That’s a great virtue. I think Americans are fantastic people, amazing,” he says. And while Tynan claims that “America has given me so much more than I’ll ever be able to give back,” those who have attended his concerts, basking in the stirring beauty of his music and rolling with laughter at his self-effacing humor, may well just have to disagree.